4, named First Manned Lunar Landing. 12 official NASA color photos that were produced by the U. S Government Printing Office in 1969 for the Apollo 11 Moon Landing. Each photo is high quality color and measures 11" x 14" on heavy paper stock. They are all in excellent condition with some yellowing being over 40 years old however, they are extremely beautiful and ready for framing. Once framed most yellowing should be covered. 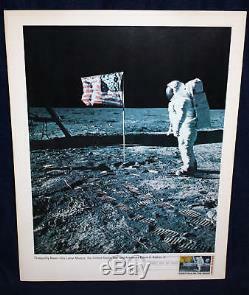 The cancellation also includes the Moon Landing cancellation from July 20, 1969. The only way you could have the stamp hand cancelled this way was to be physically present in Washington, DC on September 9, 1969, which my father was. 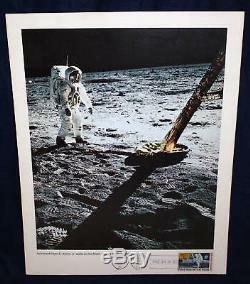 These photos are a great decorative item for the aeronautics and space enthusiast. 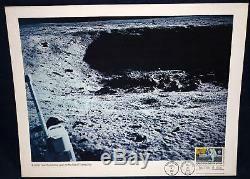 The set is also an excellent historical memento of Apollo 11 and the first manned lunar landing that involved astronauts Neil A. Armstrong, Michael Collins and Edwin E. DESCRIPTION OF PHOTOS FROM NASA. 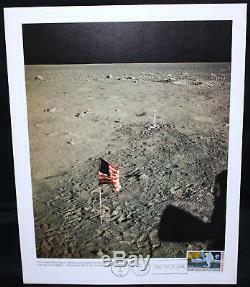 The United States flag on the Moon and footprints of the men. Who put it there-the first man on the Moon- Astronauts Neil A. The Earth as seen from Apollo 11 during its journey to the. Comes down the ladder of the. Lunar Module, ready to join Astronaut Neil A. Armstrong on the Moon's surface. Walks on the Moon, toward the. 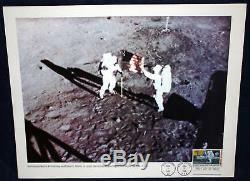 Tranquility Base-the Lunar Module, the United States flag. Aldrin's faceplate reflects Astronaut Neil. Armstrong and the Lunar Module. The United States flag on the Moon, July 20, 1969. And the laser reflector experiments toward a level spot on the lunar surface. The launch of Apollo 11-July 16, 1969 9:32 a. 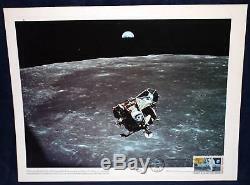 The Lunar Module, with Astronauts Neil A. Ascends from the Moon to rendezvous with the Command Module and. A crater near the landing spot, on the Sea of Tranquili. 69-HC-1016 Plaque left on the Moon. 69-HC-498 Apollo 11 Astronaut Patch. Collins Command Module Pilot, Apollo 11. CHECK OUR OTHER AUCTIONS FOR OTHER PHOTOS IN THIS SET!!! All names that are used in our descriptions are registered trademarks of their respective companies. I stake my reputation on the line when it comes to the products I list. The description of the item did not include information regarding a GROSS MISREPRESENTATION or MAJOR defect in the item. Please be aware that we do our best to describe every aspect of each item we sell. Some items which may be considered USED or VINTAGE can be expected to have normal wear and tear, unless otherwise stated. PLEASE NOTE: A return will not be granted for any other reason. IF YOU LIVE OUTSIDE THE U. Sellers: Add a FREE map to your listings. 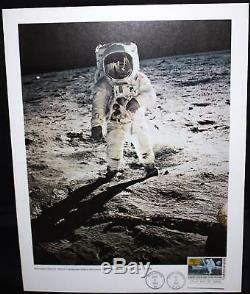 The item "C76 FDC Apollo 11 Lunar Landing NASA 12 Photo Set Postal 11x14 FREE SHIPPING" is in sale since Friday, December 8, 2017. 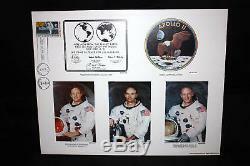 This item is in the category "Collectibles\Historical Memorabilia\Astronauts & Space Travel\Exploration Missions\Apollo". 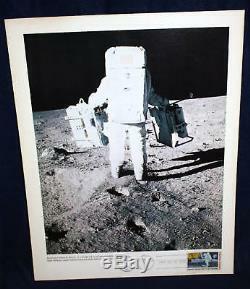 The seller is "nobbc2002" and is located in Plainview, New York. This item can be shipped worldwide.